Noncommunicable diseases (NCDs) affect people of all age groups all over the world. Forty million people die each year from NCD. Among them, 1.6 million deaths occur due to inadequate level of physical activity. An adequate level of physical activity or exercise has several benefits such as weight control, reduction of cardiovascular diseases, type 2 diabetes mellitus, and metabolic syndrome. The beneficial effects of exercise do not only improve physiological state of an individual, but it also helps to improve the mental health. Though we are aware of the beneficial effects of exercise, many of us are bounded by several barriers (e.g., lack of time and place for exercise, lack of motivation). Suitable time for exercise is one of the most important barriers nowadays. An average homemaker makes breakfast, prepares children for school, makes lunch, evening snacks, and dinner, and looks after the family members. Hence, little time is available for exercise. Along with this, lack of self-motivation and encouragement from family members are often low. Family obligations and social influence further suppress the desire to exercise. We conducted a survey on a convenience sample of nonexercising homemakers from a suburban area in West Bengal, India. After verbal consent, respondents were interviewed about the perceived barriers to exercise. A total of 169 homemakers participated in the survey with a mean age of 34.01 ± 4.09 years. The respondents had the option to select more than one barrier they face for exercise. The survey response is shown in percentage in [Figure 1]. Major perceived barrier was lack of time for exercise (32%), followed by lack of suitable place or space for exercise (27%). 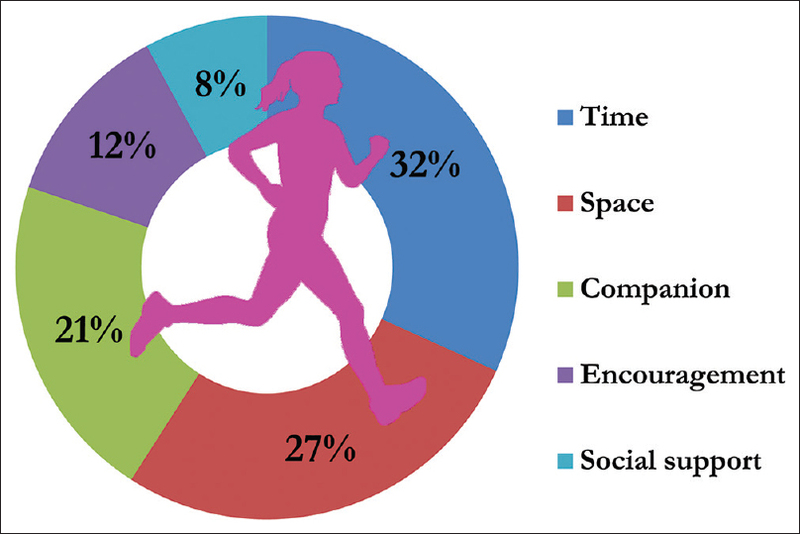 A significant percentage (21%) finds difficulty to get a companion for exercise. These barriers should be broken for better health. However, the big question is “How to overcome those barriers?” It is evident from our survey that time and place are the major barriers. Hence, an exercise program which can be executed at home within a less span of time should be adapted. Zumba dance can be a mode of exercise for homemakers who get less time and scope for exercise. Although it is commonly practiced in a group, anyone can adapt it for solo exercise. Videos can be played on personal computers, televisions, or smartphone for a visual guidance. The dance form is particularly designed for exercise and not for entertainment. Hence, cross-cultural acceptance is more. Homemakers can practice it several times in a day with each session spanning for short duration. This would be considered as “something” while they were in “nothing” for exercise and they can be benefited from the exercise. We thank the surveyor for her help in data acquisition. We also thank all the participants for their participation in the survey. Noncommunicable Diseases Fact Sheet. Geneva: WHO. Available from: http://www.who.int/mediacentre/factsheets/fs355/en/. [Last accessed on 2017 Nov 15]. Physical Activity and Health. USA: Centres for Disease Control and Prevention. Available from: https://www.cdc.gov/physicalactivity/basics/pa-health/index.htm. [Last accessed on 2017 Nov 15]. King NA, Hopkins M, Caudwell P, Stubbs RJ, Blundell JE. Beneficial effects of exercise: Shifting the focus from body weight to other markers of health. Br J Sports Med 2009;43:924-7. Overcoming Barriers to Physical Activity. USA: Centres for Disease Control and Prevention. Available from: https://www.cdc.gov/physicalactivity/basics/adding-pa/barriers.html. [Last accessed on 2017 Nov 15]. El Ansari W, Lovell G. Barriers to exercise in younger and older non-exercising adult women: A cross sectional study in London, United Kingdom. Int J Environ Res Public Health 2009;6:1443-55. Helmer J. Zumba: Benefits and What to Expect. Available from: https://www.webmd.com/fitness-exercise/a-z/zumba-workouts. [Last accessed on 2017 Nov 15].